Update: Is this list still relevant? Let’s see … Jack Kerouac, Aldous Huxley, JD Salinger, L Ron Hubbard. Yep, still relevant. Huh, and I’ve only read 11 of these books. Time to get to work. Cult books are somehow, intangibly, different from simple bestsellers … though many of them are that. The Carpetbaggers was a bestseller; Zen and The Art of Motorcycle Maintenance was a cult. They are different from books that have big new ideas … though many of them are that. On The Origin of Species changed history; but Thus Spoke Zarathustra was a cult. They are different from How-To books … though many of them are that. The Highway Code is a How-To book; Baby and Child Care was a cult. 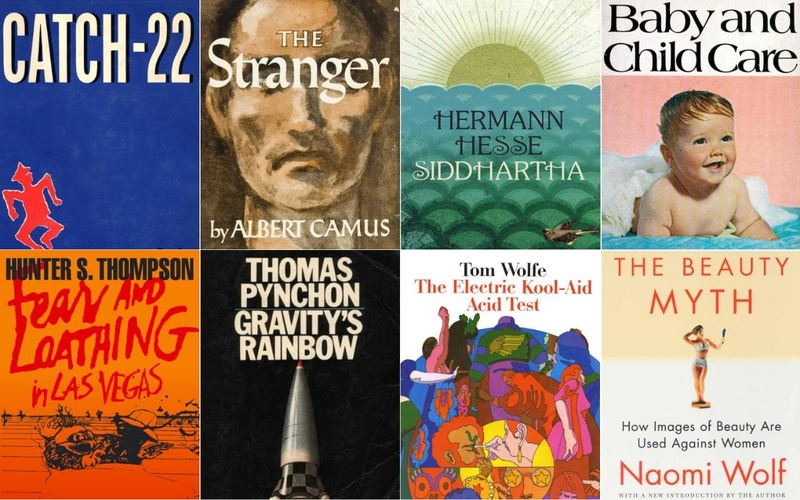 These are books that became personally important to their readers: that changed the way they lived, or the way they thought about how they lived. I’ll admit to 23, but I was just looking for the naughty bits for some. Two or three of some others I sort of flipped through to look at the pictures (a surprising number of these titles were famous for the B&W and colour plates inserted in the middle of them).